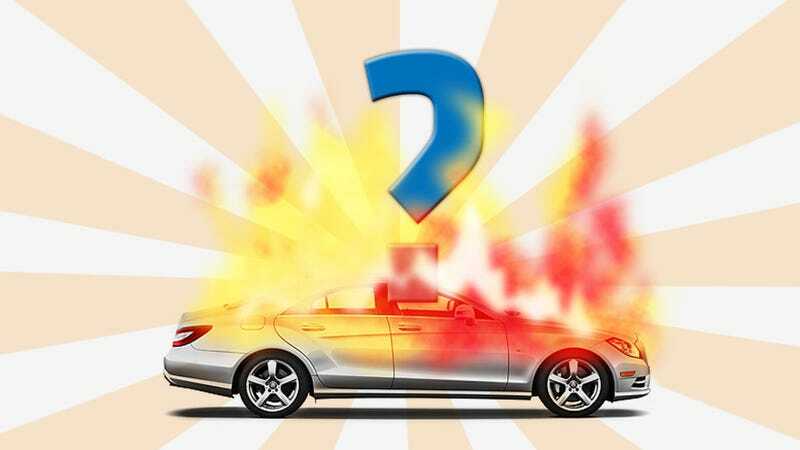 Last week, noted journalist Michael Hastings was killed in a tragic and dramatic car crash that ended with his new Mercedes-Benz burning in a massive fireball. The intensity of the conflagration have made many people suspicious about the wreck. We asked our physicist. From everything I've seen, it doesn't look like Hastings's car exploded, but that it burned intensely. There's a big difference. We talk about how cars don't explode like they do in movies, but they can burn quite intensely in a way that leaves behind something that looks like it exploded. And while cars don't normally catch on fire when they crash, "normally" doesn't mean "won't ever". Let's start with why cars don't usually explode. To have an explosion, you've got to produce a lot of hot gas in a confined space so that the gas can then go rocketing outwards. Your best bet for that to happen is in the car's gas tank, since you've got gasoline in an enclosed space, but it's hard to make that happen. For one, gasoline by itself isn't explosive. We explode it in car engines, but to make that happen the engine vaporizes the gasoline, turning it into gas, and mixes that with air before introducing the spark of flame to create the explosion. If you light a cup of liquid gasoline, it'll burn merrily but it won't explode. For another, even though there's gasoline vapor in the tank, you've got to add a source of fire to get it started. Like my dad always told me when we worked on engines, you need fuel, air, and fire to make an engine go. The same's true of a fire. You need something to burn, air to allow the fire's oxidation reaction to occur, and some kind of flame or spark to set the whole thing off. Gasoline won't catch on fire all by itself until it reaches around 500 degrees F, so you've got to introduce a flame to get the gasoline in the gas tank going. But to do that, you've got to punch a hole in the tank to get the flame in there, as fire won't normally travel up a fuel line to the tank because there's not enough air in the line to keep the flames going. But if they don't explode, why is Hastings's car burning like it is? It's because cars will burn quite happily if you get them going. You've got a lot of plastic and foam inside a car, and while recent standards require cars to include flame-retardant material in the passenger cabin, "flame retardant" doesn't mean "won't burn". Once those materials start burning, they'll burn hotly and intensely for some time. The Hasting car fire could have started in any number of ways. A collision shoves hot pieces of metal into places they're not meant to go. Fuel lines get sheared, holes get poked in gas tanks, and sparks fly. I can imagine a scenario where a cut fuel line sprays fuel around enough to start the fire, or the seam between the fuel tank and the rest of the fuel system breaks, or metal jams through the fuel tank. It's rare for this to happen in a collision, but it's not unheard of. Back in 2008, the National Fire Protection Association looked at how US vehicles catch fire. From 2002 to 2005, only 3% of the vehicles that caught fire on US highways did so because of a collision, but that corresponded to 8,100 fires. (Source: http://www.nfpa.org/assets/files/p…) That's more than 5 vehicle fires caused by a collision every day. While most of those fires started in the engine and were less likely to be fatal, around 10% of the collisions that involved fire were because of a fire from the fuel tank or fuel line. Just because something happens rarely doesn't mean it can't happen. I can't prove that Hastings's death was accidental, but it's not as far-fetched as you might imagine.